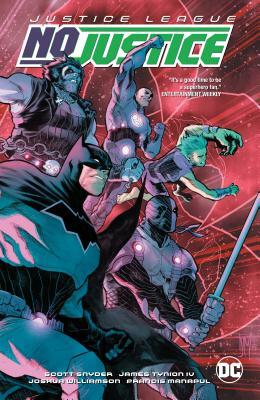 The creative team of Scott Snyder, Joshua Williamson, James Tynion IV and Francis Manapul unleash new super-teams in Justice League: No Justice. The events of Dark Nights: Metal have transformed the universe in ways both wonderful and terrifying...and unleashed four ancient entities with the power to destroy it all. Mystery. Wonder. Wisdom. Entropy. These four forces govern all of existence, and now the godlike beings who embody them have awakened. All life is in jeopardy, and the only chance the superheroes of Earth have to stop the unthinkable lies in new alliances...the likes of which have never been seen before! Superman, Starfire and Martian Manhunter search for the secrets of the cosmos in Team Mystery! Batman, Beast Boy and Deathstroke battle chaos itself as Team Entropy! Wonder Woman, Zatanna and Etrigan the Demon unlock bizarre alien technologies with Team Wonder! And the Flash, Cyborg and Harley Quinn learn the astonishing truths of Team Wisdom! Collects issues #1-4 and stories from DC Nation #0. Scott Snyder is a #1 New York Times best-selling writer and one of the most critically acclaimed scribes in all of comics. His works include Dark Nights: Metal, All Star Batman, Batman, Batman: Eternal, Superman Unchainced, American Vampire and Swamp Thing. He has also been published in Zoetrope, Tin House, One-Story, Epoch, Small Spiral Notebook and other journals, and has a short-story collection, Voodoo Heart, which was published by Dial Press. He teaches at Columbia University and Sarah Lawrence University and lives in New York with his wife, Jeanie, and his son, Jack Presley.